Here you get the CBSE class 10 Mathematics chapter 9- Circles: NCERT Exemplar Problems and Solutions (Part-IIA). This part constitutes only the Very Short Answer Type Questions. You will find here the solutions to question number 1 to 5 form exercise 9.2 of NCERT Exemplar for Mathematics chapter 9. 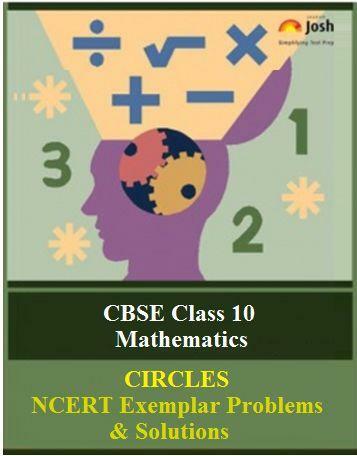 Here you get the CBSE Class 10 Mathematics chapter 9, Circles: NCERT Exemplar Problems and Solutions (Part-IIA). This part of the chapter includes solutions to Question Number 1 to 5 from Exercise 9.2 of NCERT Exemplar Problems for Class 10 Mathematics Chapter: Circles. This exercise comprises only the Very Short Answer Type Questions framed from various important topics in the chapter. Each question is provided with a detailed solution. Questions. 1 If a chord AB subtends an angle of 60° at the centre of a circle, then angle between the tangents at A and B is also 60°. We know that a tangent at any point on a circle is perpendicular to the radius through the point of contact. Questions. 2 The length of tangent from an external point P on a circle is always greater than the radius of the circle. The length of a tangent from an external point may or may not be greater than the radius of the circle. Questions. 3 The length of tangent from an external point P on a circle with centre O is always less than OP. Let PT be a tangent at point T lying on a circle with centre O. Join OT. As, in a right angled triangle, hypotenuse is always greater than any of the two sides of the triangle. Hence, the length of tangent from an external point P on a circle with centre O is always less than OP. Questions. 4 The angle between two tangents to a circle may be 0°. Angle between two tangents to a circle will be 0° only when the two tangents will coincide with each other or will be parallel to each other. Questions. 5 If angle between two tangents drawn from a point P to a circle of radius a and centre O is 90°, then. We know that any two tangents drawn to a circle from an external point are equally inclined to the line segment, joining the centre to that point.